The Watson family lived in the Ellengowan community. Mary put a great deal of effort into this publication and it's a great resource for all families living in the Ellengowan area from the early 1850's to today. Some families are: Alexander, Atkinson, Bain, Belbeck, Bell, Bluhm, Bradley, Butchart, Cargill, Cassels, Catto, Clark, Coates, Corduck, Cormack, Corum, Crawford, Dalgarno, Dobbie, Driscoll, Elder, Gibson, Graham, Gregg, Harper, Hodgkinson, Hopper, Hood, Hunter, Irwin, Johnston, Jones, Kellough, Leslie, Mahon, Martin, Maxwell, MacGregor, McCarthy, McCurdy, McLean, McWilliams, Minty-Fiddis, Munro, Morland, Munn, Neeland, Rathwell, Relihan, Rody, Roumey, Scott, Skinner, Spong, Stewart, Sweeney, Teeple, Thornburn, Underwood, White, Watson. Beatrice has written a wonderful history of the hamlet of Eden Grove, including several pioneer family histories. Families profiled: Alexander, Atkinson, Bailey, Banting, Belbeck, Bowes, Butchart, Cargill, Catto, Childs, Clark , Connor Corum, Dalgarno, Desmond, Eckford, Fair, Gallinger, Gregg, Kerry, Lamb, McCarthy, McDowell, Napper, Parker, Perdue, O'Rielly, Overand, Proud, Reed, Stansal, Ward, Watson, Wells, Young. ELORA The Early History of Elora and Vicinity - By John Cannon, 1930. “This book provides little-known details about the settlement and development of the Elora area from the time the first log shelter was built by Roswell Matthews within sight of the Grand River 's falls in 1817. From then until 1833, John Cannon writes, "Elora seemed to be at the end of the civilized world. On the west side of the river there was not a settler between Elora and Lake Huron "
It then goes on to recite the Obituary for William Brockie. Reprinted by the Bruce County Historical Society 1971 and again in1993. “The writer of this book would call your attention to three things: first the contents are actual experiences and conditions which are in no way colored or embellished; second there is no pretense to literary excellence, and third that it is written that the reader may see the great strides of progress made in one generation and not forget the great pioneer days of our great country.” David Kennedy Sr., 1903. A comprehensive description of what the area of Bruce County around the Saugeen was like in the early 1850's. 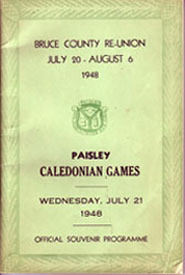 in bygone years as submitted by former Paisleyites, many potographs and 1948 advertisinments. Ralph Parker, son of Giles & Marian, was born and raised in Paisley. In 1950 he joined the Hudson's Bay Co. Raw Fur Department and left home eventually sttling in Moberly Lake, British Columbia. 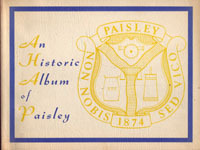 His book, published in 1995, has many great anecdotes about life in Paisley through the 1930 and 1940's. "There were two blacksmith shops in Paisley, colveniently located so that I could stop at each one on the way home from school. Tey were special places. Often a team of horses would be tied in the stall inside. The "smithy" would be turning the crank on the blower." The east part of the Township of Bruce was surveyed in 1852, and it was in that year that Allan McLean came from Tiree, Scotland, and settled on the "Eighth Concession." For a time he was the lone settler in that area, but soon new home-seekers began to come in, and settle on the neighboring concessions, as well as on the eighth. The majority of these first settlers had emigrated from Scotland, and many, such as Allan McLean, spoke only Gaelic. The centre of this little community became known as Gresham, and had a Post Office, store, blacksmith a small weaving industry, a saw-mill, and probably other activities. The vital centre in the life of the comununity, and the only one to remain through the five generations, has been the Centre Bruce Church. Various stories of Pioneer life in the Tiverton area of Bruce County. On April 8,1868, a "bee" was held and the church building raised. The weather was cold with blowing snow, and the men were obliged to build a fire to keep themselves warm, while the men on the corners were fitting and putting the logs into place. These corner men were John Cameron, Owen Webb, David Metcalfe and Adam Purdy. In spite of the storm, they went ahead with the work, and when night came they had the four walls up ready for the rafters. Present at the raising, besides the Methodists, were Anglicans, Presbyterians and Baptists. I have the following Year Books in my library, if anyone would like something looked up please contact us by e-mail. 1968, 1969, 1971, 1973, 1974, 1975, 1976, 1977, 1981, 1986, 1987, 1988, 1989, 1992, 1993, 1998, 2005.